Parallel cable assemblies connect two PCs via parallel ports. These assemblies are common where older versions of peripherals like printers or scanners need to be connected to computers. Parallel cable assemblies allow multiple data blocks to be transferred simultaneously from one device to another, which increases the overall transfer speed. What are parallel cable assemblies used for? Parallel cable assemblies are typical in industries where legacy computer technologies and peripherals are in operation. Examples include educational facilities like schools and universities where printers, scanners and older monitors are used. Many SMEs (small and medium-sized enterprises) in the manufacturing and production sectors also use parallel cable assemblies due to their high-speed transfer attributes. Parallel cable assemblies enable connections to motherboards in systems with disk drive applications, and they are also used to link to external circuit boards. File transfer cable assemblies to transfer multiple data bits at high speeds from one computer to another. 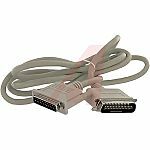 Parallel printer cable assemblies to connect with legacy printers and scanners. DB25 parallel extension cable assemblies to extend current parallel cables up to fifty feet.